Even Mustang fanboys will have to agree. The 2017 Camaro ZL1 is a seriously mean machine. It has a 6.2-liter supercharged V8 under the hood making 640 horsepower and 640 lb-ft of torque. We’ve said it could put the fear of God into the Ford Mustang Shelby GT350 and we stand by that, especially after seeing this video. 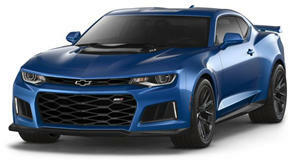 It features the new ZL1 running around the Nuburgring. Its supercharged V8 emits a wonderful sound, and the trim and track-focused muscle car looks right at home screaming around the legendary German race track. According to YouTuber cvdzijden - Supercar Videos, the video’s uploader, the new ZL1 sounds better than the upcoming Z/28, which was apparently also testing that day. We’re not so sure about that one, though.